Text: September 23. — Mr. Jefferson’s Rip Van Winkle is preceded by the Nan of Mrs. Mellon (Miss Woolgar) in ‘Good for Nothing;’ and that picture of the true-hearted, neglected girl, who plays hopscotch with the street boys, and when the woman’s heart in her is touched with jealousy, breaks awkwardly out of her tattered slovenliness, familiar to London eyes as are the actress and the part, is set before us in a piece of acting certainly as good as the new actor’s Rip Van Winkle. Mr. Jefferson’s Rip Van Winkle is Washington Irving’s, set in a play that seeks dramatic effect by tasteless variations from the tale as Irving told it. As the village schoolmaster in ‘Deborah’ was transformed for the American ‘Leah’ into a conventional stage villain, so here the harmless schoolmaster, Derrick Van Bummel, is selected for the villain’s part. The first act is brought to a melodramatic close by Rip‘s wife driving her husband from her hearth into a thunderstorm. He goes out snivelling. She of course cries in vain to him to return, and, as the curtain descends, plumps on the ground in the orthodox melodramatic swoon. This may be great improvement in the eyes of an American audience; but an English audience, with a really good actor before them, would have entered, perhaps, quite as readily into the original notion of Rip‘s wandering off for a lazy autumn scramble, escaped from the labour of the farm and his wife’s clamour. In the second act we have the adventure on the mountains with the ghost of the old discoverer of Hudson river and his solemn crew of nine-pin players. Here the story is closely followed, except in the poor melodramatic change that substitutes for Rip‘s attendance on the company and his sly pulls at their flagon, a formal attendance of the company upon him as the drinker, and the conventional Ha! ha! ha! ha! when he drinks. The original story made them absolutely mute, allowing no sound but the thunder produced by the rolling of their bowls. The adapter, however, having ghosts on hand, could not dispense with the conventional effect of the Ha! ha! ha! ha! ha! In the third act all the delicacies of the rest of the story are smothered in the garlic and onions of the melodramatist. Yet all this latter part of it is precisely the dramatic part of the original. 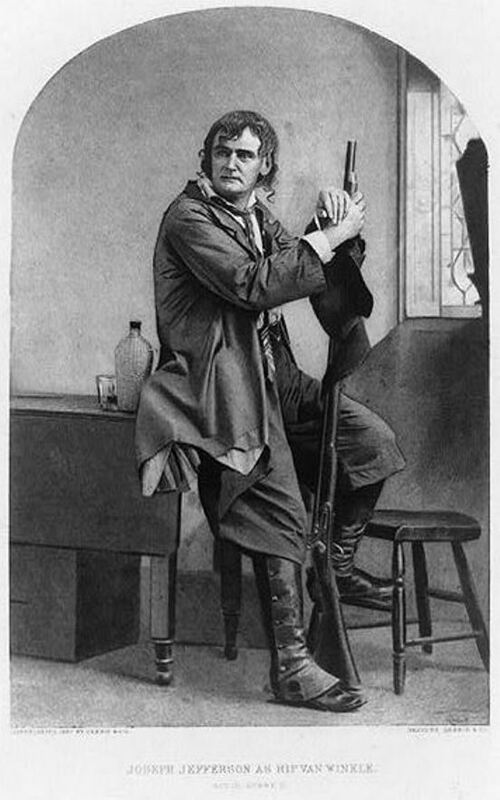 The happy notion of making the American revolution fall within the twenty years of Rip‘s sleep, and bringing the dazed man, who had left his village as a subject of King George, back into the bustle of a republican electioneering crowd, for which the story supplies figures ready sketched, would suit the humour alike of a good dramatist and a fine actor. Surely there can be no actor of high mark who would not rather have his Rip left on a bench, astonishing the gossips by the door of Doolittle’s hotel, than presented with the claptrap effects of a wife who has been borrowed and improved during his absence, and a magnificent collection of town lots to make him happy ever after. As an actor, Mr. Jefferson marks Rip‘s weakness of character by giving very skilfully an air of picturesque and easy indolence to all his postures and movements, while his good-humoured Dutch English is spoken with a quiet laziness. When, as he sits out of doors by the innkeeper’s table, the innkeeper’s little son Hendrick tells him how he means to go to sea in a whaling ship, and has promised to come home and marry Rip‘s little daughter Meenie, and the two children kneeling at Rip‘s knees tell of their true love, the twinkle of humour in Rip‘s way of listening to them, as one who finds a quiet luxury in his admission to communion with children’s happy thoughts, and his nod to them over a wine-cup with his customary toast, “Well, here’s your health and your family’s. May they live long and be happy,” is acted with much quiet delicacy. In the scene with his wife in the cottage – the wife’s part being so acted by Mrs. Billington as to be one of her marked successes – it is impossible to cover the defect of bad invention by the dramatist. A long story about shooting at a rabbit and not hitting it is very tedious fun, and it is but a coarse stage effect to make Rip drink out of a spirit flask over his wife’s back while she is embracing him because he has again “swored off” his evil habit. Rip was goodhearted, and his faults came of his laziness. Such a situation, though it may be a broad stage effect, degrades him far too low. It was necessary, it – may be said, to degrade Rip in this and other ways to account for his wife’s turning him out of doors into a thunderstorm. But it is a pity that the dramatist could not deny himself that incident, and be content to carry through from first to last the lazy humour of the story. In the second act, Mr. Jefferson, as Rip van Winkle among the ghosts, acts as well as the dramatist will let him. But the words put in his mouth are poor, and the variations from the original story are in a dramatic sense, for the worse. Rip falls to his twenty years’ sleep, and the ghosts leave him. The opening of the third act shows him at his awakening with rotten clothes and long white hair and beard, – an exaggeration not required. The story had said that his beard was grey, and grey would be, in the dramatic rendering, more truly effective. The drama in this act is at its poorest, but Mr. Jefferson is at his best. Retaining his old Dutch English with a somewhat shriller pipe of age in its tone, he quietly makes the most of every opportunity of representing the old man’s bewilderment. His timid approaches to an understanding of the change he finds, his faint touch of the sorrow of old love in believing his wife dead, and reaction into humorous sense of relief, his trembling desire and dread of news about his daughter, and, in a later scene, the pathos of his appeal to her for recognition, are all delicately true. It is doubtful whether, in such a drama, more could be done by the best effort of genius to represent the Rip van Winkle of whom Washington Irving tells. It is certain that in a play more closely in accordance with the spirit of the story, Mr. Jefferson’s success, real as it is, would have been yet more conspicuous. Comments: Henry Morley (1822-1894) was a British academic and writer. He was Professor of English at University College London from 1865-1889. His Journal is a record of his attendance at most new production in the leading London theatres over a fifteen-year period. The journal he kept served as the basis for his dramatic reviews in The Examiner, which he edited 1859-1864. The production of Rip Van Winkle that he saw was produced at the Adelphi Theatre, London, 23 September 1865. Joseph Jefferson (1829-1905) was one of the great figures of the American stage in the nineteenth century, most celebrated for playing Rip Van Winkle for four decades. There were various adaptations of Washington Irving‘s story that Jefferson originally used, but the production first seen in London on 5 September 1865 had been significantly revised by Dion Boucicault and formed the basis of his success in the part thereafter.